I've been hoping to be back here at Manila Temple Philippines in Quezon City. This is the place where I got married just like thousands of my church-mates and friends who chose this place for an eternal marriage ceremony. If you have traveled to White Plains in Quezon City and noticed this heavenly place, you're aware now that this is the Manila Philippines Temple . I know that I have friends who are not aware that I frequently visit this place because I am a latter-day saint (LDS), otherwise known as a Mormon. Just a quick reminder and as an answer to the silent questions of my friends, the central figure of our church is Jesus Christ, so the church is named after Him. We also have four standard books such as the bible (King James Version), The Doctrine of Covenants, The Pearl of Great Price and the Book of Mormon that is another testament of Jesus Christ. We gather in the meeting place that is built in each area that we live and worship every Sunday with corresponding Sunday School after the sacrament meeting. If you are also curious as to my distinct style, that is so modest, that is because I chose to follow a standard of clothing that we teach to our young women across the globe. 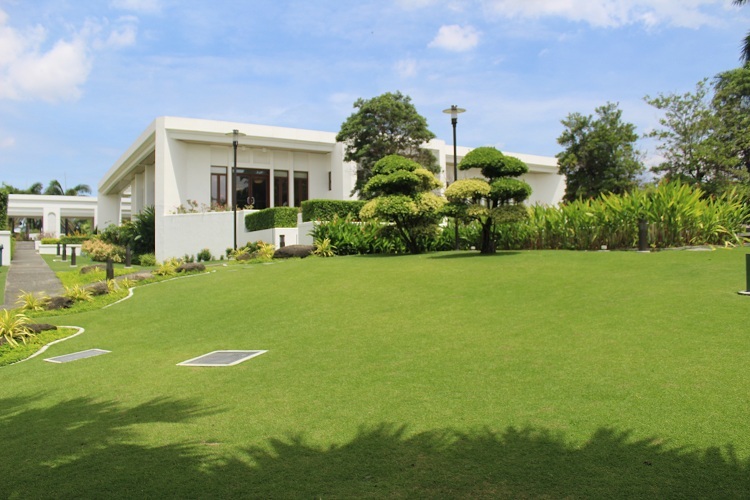 The Manila Philippines Temple, which is located at 13 Temple Drive, Greenmeadows Subdivision, Quezon City, 1110 Metro Manila, is one of the operating temples of The Church of Jesus Christ of Latter-day Saints. There is also another temple in Cebu, Philippines and also soon in Urdaneta, Philippines. I've decided to write a short post about my latest visit here since the groundbreaking of this holy place in the metro was 35 years ago on August 25, 1982. 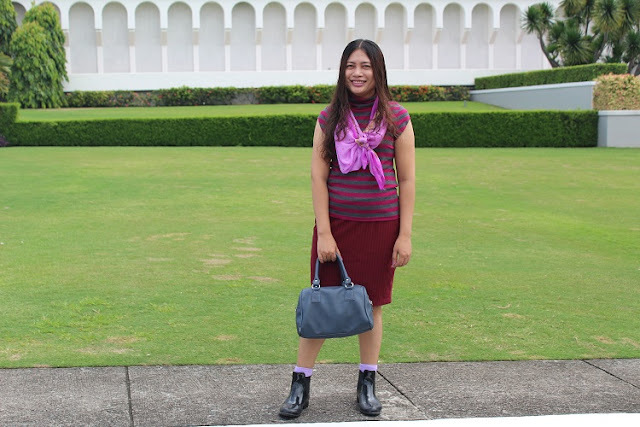 I am still following the modest standard of clothing up to now so I decided to don a knee-length skirt that I teamed with a Uniqlo stripe shirt and a pair of black boots. To complete the look, I chose to accessorize it with a small lavender scarf that will match my lavender socks. 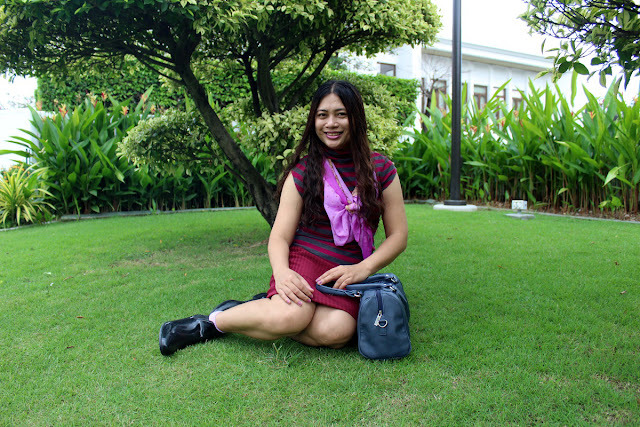 My original plan is to wear a pair of heeled shoes to match the knee-length skirt and stripe shirt but I thought it wasn't perfect for traveling to Quezon City, Philippines. Essentially, I preferred comfort over style this time around. The shirt is originally a long-sleeve piece but I cut the sleeves since I want to feel comfortable during travel. It is obviously a struggle to wear formal clothing when it is hot outside so I have to find ways to do it. From Guadalupe, we preferred to ride a bus to Ortigas and drop by the mall to eat breakfast. Then, we hopped on a cab to reach the temple before noontime. It was a quick travel because there is heavy traffic at that time. We arrived home before early dinner by riding the Temple Shuttle to Ortigas and then by bus to Guadalupe. It's just one jeepney ride to reach the apartment after that. My husband and I also bought church-related books and supplies after visiting the temple. The weather isn't really good since it's too hot outside with no signs of rain. I even have to wait for a little shade so we can take photos. Despite everything, I was happy that we were able to travel this time. The temple has given me peace of mind for so long that I always see it as heaven on earth. Did you like this post? Then pass it on to your friends! Connect with me through my Facebook Page, Instagram and Twitter. Take care and good luck.